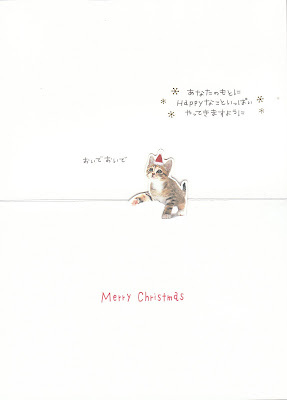 My postcard pal at the Ayaori post office sent this charming pop-up card in her New Year's packet, which arrived yesterday. 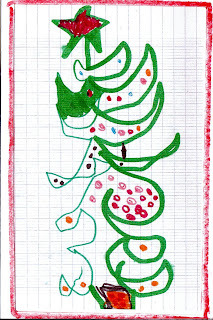 She always sends the most amazing cards, almost always a pop-up of some kind. 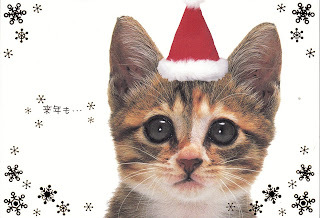 Some are as sweet and simple as this tiny kitten pop-up, others are more elaborate but no less charming. I don't know where she gets them but I do know they are just about the most imaginative of the commercial cards I receive each year. And so to everyone, may all good things come to you and yours in 2009! 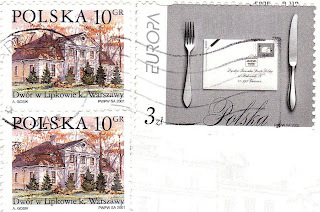 Sniezka means snow white, wrote the Polish postcrosser who sent this postcard. It's also the name of the highest peak in a mountain range in Sudety, at some 1602 meters above sea level. 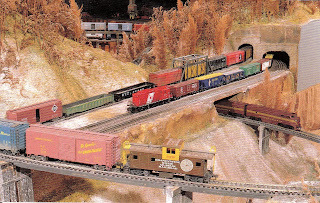 I bought these postcards yesterday at the Brandywine River Museum in Chadds Ford, PA. Each Christmas the museum shows off its trains, which run on 2,000 feet of track, while a tiny Santa circles overhead in his sleigh. Andrew Wyeth founded this wonderful museum, in a beautiful former mill. 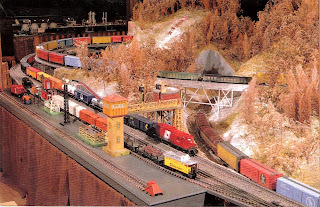 It houses a good collection of works by him and other artists in the Wyeth family, including son Jamie, who also has an extensive collection of toy and model trains. Jamie even got Andy Warhol hooked on them. The two often played with them when Warhol visited the younger Wyeth's farm. 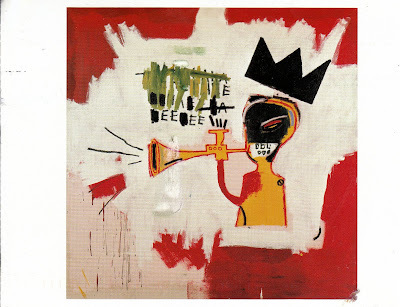 Lynn Berkowitz sent this postcard of an explosive Basquiat painting called Trumpet. 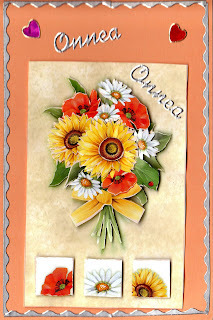 This pretty homemade card came from a Finnish postcrosser. She says that such cards are now popular in Finland. 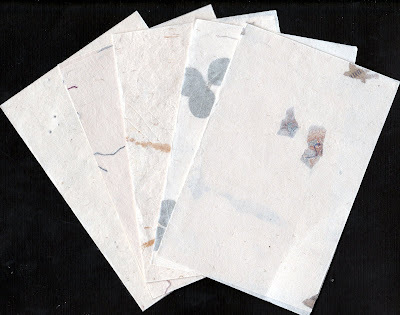 A Canadian friend sent me this delicate handmade paper from Bhutan, souvenirs of a trip she made to that country. Now to write some letters! 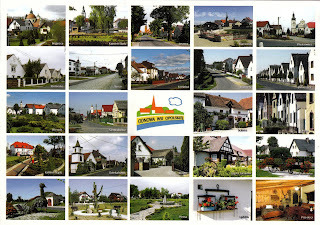 A Polish postcrosser sent this card showing thumbnail images of places around her hometown of Opole, in the south of Poland. 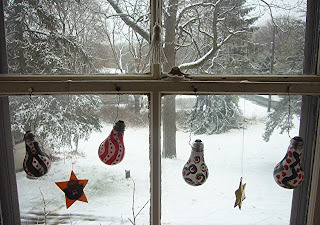 I made this card from a photo I took last week of the painted light bulbs I use to decorate the windows at Christmas. I got the idea at Olga's Living with Art, a fabulous shop in Coudersport, PA, on Rt. 6, which is run by a multitalented Ukrainian woman named Olga. Her painted bulbs were elaborate and beautifully-painted. I simplified the idea, using old incandescents. This salt pyramid is astounding. 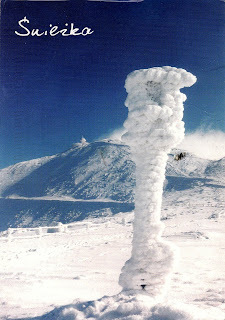 It instantly reminded me of the conical structures, for storing salt used in winter, which are seen along major highways here in the Northeast. 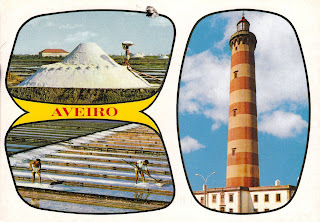 A Portuguese postcrosser sent the postcard. 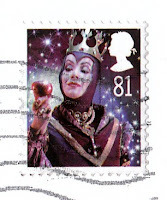 The stamps are so nice that I had to (I think) post them twice. 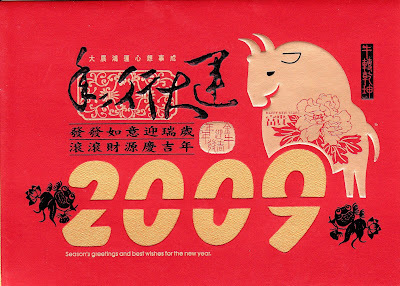 A Taiwanese postcrosser got a jump on the Year of the Ox with this New Year card. She's studying Japanese and wrote greetings in Chinese, Japanese, and English. 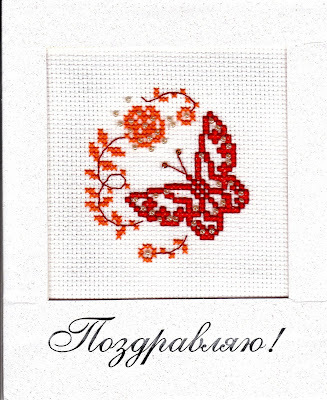 A Russian postcrosser named Elena stitched this pretty butterfly with flowers, ornamented it with beads, and made it into a card. Thanks so much! 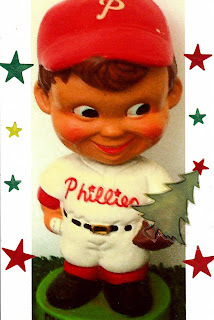 Jacqueline sent this fabulous bobblehead Christmas card! It was by far the nicest one I received this year. Russia, France, Finland, Taiwan, and Japan present and accounted for. Twin brothers Alistair and Jonathan made their family Christmas cards. I happened to get this fab tree drawn by Alistair, who wished that he had some glitter glue on hand to finish it off. 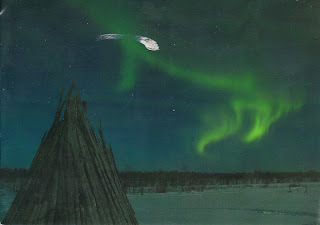 Beautiful and mysterious---a perfect card for the winter solstice, courtesy of a 15-year-old postcrosser in Finland. I spied this mailbox in the San Bruno post office. It must be the real thing!!! 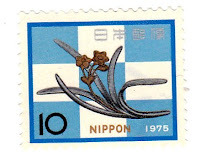 The stamps above were on a Christmas card from a Canadian friend. 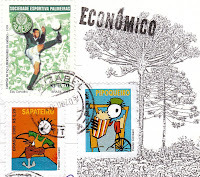 Those below, which feature more stamps from the Hector Corsini series, were on a pretty postcard from a postcrosser in Curitiba, a major city in southern Brazil. 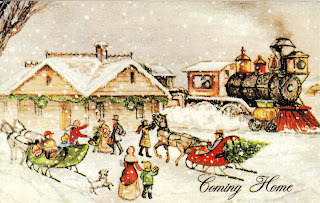 Holiday greetings from a Finnish postcrosser. And a Happy Yule to you, too! 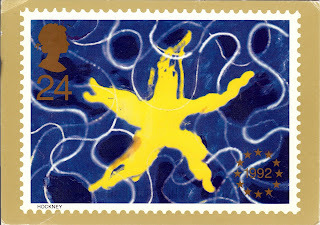 A British postcrosser sent this cool stamp postcard from 1992. It never gets old. 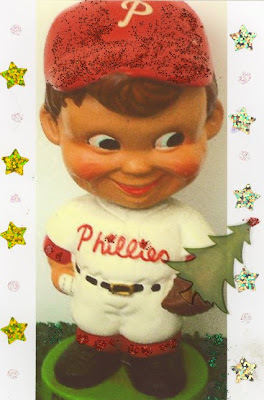 Holiday greetings from Dave the mail carrier. 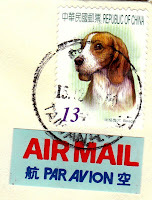 This stamp was on a card from a Portuguese postcrosser. 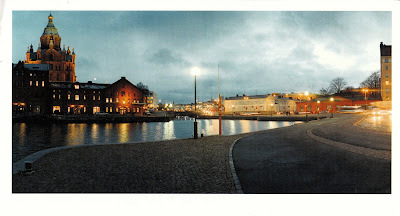 A Lithuanian postcrosser named Mykolas, who lives in Wales, sent this high-protein, color-saturated postcard. 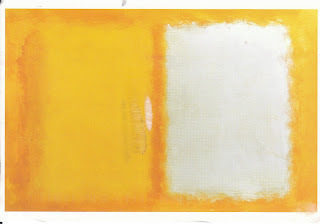 It's of a Mark Rothko painting. 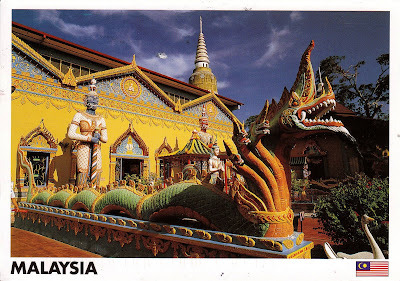 This jolt of color and energy came from a postcrosser in Malaysia, who likes sacred places and dragons. This is one of her fav temples. 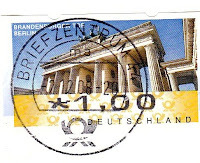 These stamps are courtesy of a German postcrosser in Hamburg. 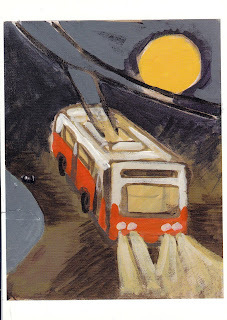 Mrpotani sent this postcard showing an evocative painting of a Muni bus by moonlight. 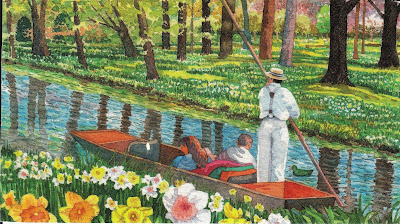 Both the card, from a German postcrosser, and the stamps, from a Japanese friend, defy the season, though in truth here in eastern Pennsylvania we're having another odd warm spell with rain. 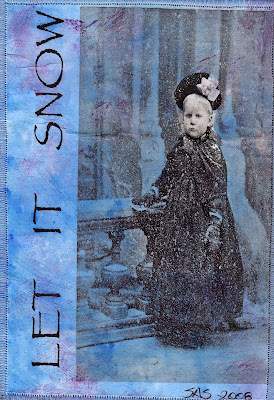 This beautiful handmade Christmas card came from friend Sandy S., who used the muslin-backed paper technique I learned from her last month (see November 26). The image is so Winter Palace. 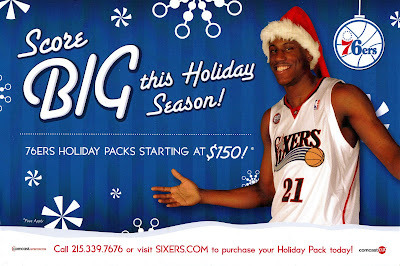 Cutie Thaddeus Young--in his second year but still a baby--is hard to resist in this holiday ad card from the Philadelphia 76ers. An eight-year-old Ukrainian postcrosser named Polina, who likes to play Monopoly, sent an excellent card and wonderful stamps. The card shows a square in the city where she lives. 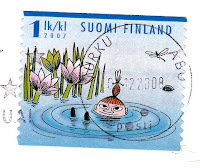 Cool stamps from Finnish postcrossers. This pretty card of Uspenski Orthodox Cathedral came from a postcrosser in Helsinki. 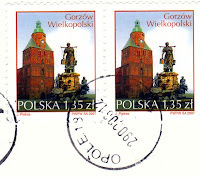 Great stamps from a Polish postcrosser. The place setting is super! 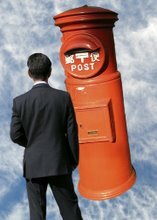 I like what a Slovenian postcrosser did with her card. She turned a simple message into cheery greetings. 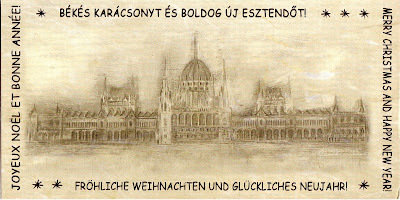 Just as I was longing again to be in Budapest, this card arrived from a Hungarian postcrosser living in the UK. It shows the beautiful Hungarian Parliament Building, which sits on the Pest side of the Danube.